As we all know that ONGC is an Indian Maharatna Public Sector Company (PSU) engaged in the production of Oil and Gas In India and abroad. 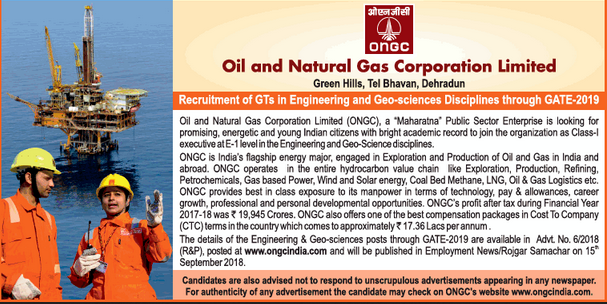 As per the official notification, ONGC is looking for young and energetic Indian citizens for the posts of Graduate Trainees (Class-1 Executive at E-1 Level) in Engineering and GeoSciences disciplines. Let's have a look at the detailed Info. Graduate Degree or Post Graduate Degree in respective disciplines. Candidates pursuing the final degree are also eligible If they can submit required certificates by 31st July 2019. Candidates with a reservation have to submit their caste certificate at the time of Interview. Candidates who are appearing for the following GATE Exam are eligible for the ONGC Recruitment through GATE. First, the candidates have to apply and appear in the GATE 2019 Exam. Candidates have to register online for ONGC by filling ONGC online application form available in www.ongcindia.com. The Online Application is activated in March/ April months (tentatively). Candidates with required cutoff mark prescribed by the ONGC are shortlisted for the further selection process. Candidates score in the respective subjects is considered for the shortlisting of candidates for Interview. maxmium age is how much?